In India, “hijras” are people who were born male but live as female or who are intersex. After years of discrimination, Indian society is starting to recognize their human rights. In a slum outside India’s capital, New Delhi, people dressed in colorful traditional costumes are dancing. They are hijras. India is said to have more than 5-million hijras. Many make a living performing at people’s homes to celebrate the birth of boys. People believe they have a special power to bless, and so invite them to perform for births or at weddings. But at the end of the 19th century, modern Western values began to influence India after it became a British colony. 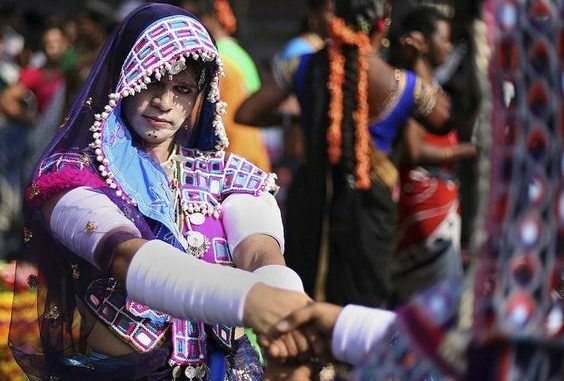 Traditional celebrations are also disappearing, so it is getting harder for hijras to make a living by performing. Renu says, even as a child, she loved dancing like other girls. But when she turned ten, her family forced her to leave home. In 2012, hijra activists filed a petition against the state, demanding their rights. Two years later, the Supreme Court gave hijras and other transgender people full legal recognition as a third gender. The ruling called on the government to give them equal access to employment. The ruling gave hijras a great boost. In cooperation with government doctors, one NGO initially focused on giving hijras access to medical services. It now also provides consultation on jobs and education. The southern Indian state of Kerala has begun hiring hijras. In June, a state-run railway company took on 23 housekeeping staff and ticketing staff. 34-year-old Ragarenjini sells tickets. She earns about 220 US dollars a month. It is much lower than an average clerk’s salary, but she says she’s happy to be accepted for who she is. “I want to prove I can do like a male or female in the mainstream,” she says. Discrimination and prejudice against sexual minorities are still strong in Indian society, but for the hijras, there is now a ray of hope.